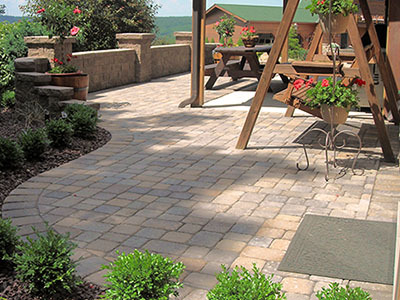 With the area’s highest reputation for outstanding patios, walkways, driveways, and brick roads built strong to last, Blooming Valley Landscape & Supply is the right company for your paver project. Whether it is a flat patio in your backyard, a winding path to your front door, a fire pit area on your property, a road on a college campus or in a town, or a classy driveway leading into your garage, or a statement piece of raised tiered patios with steps and walls, Blooming Valley is the only company you want to design and build your paver project. 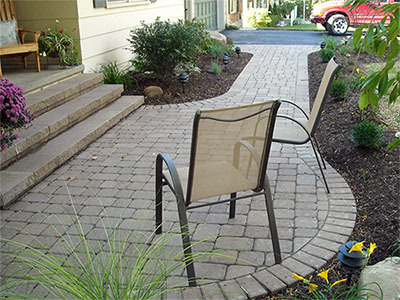 With over 15 years of experience designing and installing pavers, we have many testimonials of happy customers who love their outdoor home additions. This is due to our excellent training and certifications through ICPI and NCMA. We are also certified in cleaning and sealing existing pavers through Techni-Seal. Our hardscaping is right, built beautiful, and built to last.